Has anyone ever told you to put on the Armor of God? What exactly does that mean? As a young Christian many times this is not explained in details so that we can truly understand the how, when, what and why of this. Let’s first talk about Why you need to put on the Armor of God. We know that there is an unseen world which is the spiritual realm. In this spiritual realm there are angels and demons and they are set up in a similar structure as a real army. Unless you’ve been gifted by God to see into the spiritual realm then you won’t be able to see them. But, they can see you. Just as you have your five sense operating in the natural realm you can also operate with your spiritual senses in the spiritual realm. So those who have the eyes to see in the spiritual realm are able to see what happens there. And those who have the ears to hear what’s going on also hear into that realm. Even though you are unable to see into the realm of the spirit we know that there is a battle going on there because the bible tells us that this is happening in Ephesians 6. Just as in the natural realm when you go into battle you need armory (tanker, grenades, guns, helmet, a bullet proof vest, a gun belt, etc) in the spiritual realm you also need your armor. While you might not be able to see with your natural eyes that you have an armor on, the demons and angels can see when you are wearing your spiritual armor. This is where the Armor of God comes into play. Now that you’ve read it you may still be wondering how you put it on. It is broken down into pieces and verses 10-13 in Ephesians 6 tells us why we need to put on the armor. You see most of the quarrels and wars that we get into are actually started by demonic forces in the spiritual realm so the bible tells us that we are not fighting against other humans (flesh and blood). This is VERY important because it will really help you to not overreact or behave incorrectly in situations when you know that you are not actually at war with the person standing in front of you. Even though you may be having a conflict with that person they may actually be under the influence of spiritual forces. It tells us that there are “rulers, spiritual authority, powers and spiritual forces of evil” that are a part of the enemy’s camp. So we know that there is some kind of organized hierarchy in that realm much like an army in the natural realm. So how are you planning on fighting against this? The only way is to have on the Full Armor of God which will protect you against the devil’s schemes. When do you put on the Full Armor of God? Verse 13 says “when the day of evil comes you will be able to stand your ground”. Have you ever been in a situation when you know something bad is happening or about to happen? You’re being accused of something you didn’t do. Persecuted by others, even in the church – at work, at home, wherever it may be – things are not going well and you just cannot seem to sort it out. You’re under attack mentally, physically, emotionally – things are just not right. You know it in your spirit. You feel groggy, you can’t think straight, constantly having “misunderstandings” with others, lethargic and confused. You may not even be able to explain it in words but your spirit says you’re in danger. You’re in bed at night and you feel afraid that something is going to happen. Yes, even in your OWN bed! If you’ve experienced this then you know exactly what we’re talking about here. All of these can be classified as the “the day of evil”. You know that you are heading into a situation at work and it won’t be good. It’s a good idea to put it on BEFORE you get to work. This is the word of God. We know that God’s word is truth and when it is in the center (around your waist) of everything you do, then you will make the right decisions because your decisions are governed by God’s word. Your belt holds things together. Also, notice that it says the belt is buckled so we know that it has to be secure and therefore unable to fall off. You have to make up your mind that from this point forward all of your decisions are based on God’s word. 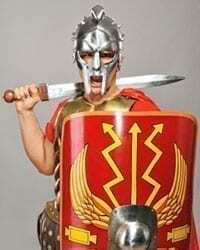 Imagine a roman soldier with his breastplate on. That’s you! Your breastplate protects your heart. Why do you need to protect your heart? Yes, the enemy would love to get a hold of your heart so that you can speak evil over yourself and others. So you can place a curse upon your life and the life of your children with your own mouth. That’s why you need to protect your heart. When your heart is filled with God’s word and God’s truth there will be no place for what is evil. “out of the abundance of your heart the mouth speaks” You see when Christ died for your sin He not only took them away He also gave you His Righteousness so that when you enter God’s throne room He no longer looks at your sins but He sees the Righteousness of Christ. When you put on the righteousness of Christ as a breastplate you are protecting your heart from evil and hence guarding what comes out of your mouth. The demons then see the Righteousness of Christ on you and they flee. Again, think of this Roman soldier with gladiator sandals. Back in those days one weapon of the enemy was to lay gall-traps, sharp sticks and other things that would obstruct the soldier and destroy their feet so they won’t be able to continue fighting. Therefore the soldiers needed special shoes to go into battle. With your feet fitted with the preparation of the Gospel of Peace, you can run and jump and do anything because you are prepared and you are not entering barefooted. You are entering this battle with an understanding of who you are because you know the Gospel of Jesus Christ which grants you peace in the midst of your battles. Peace with God, Peace with others and peace with yourself. You should always remember that you are not just fighting for yourself, you are also fighting for the Gospel of Jesus Christ to be heard all around the world. You are fighting for your children and your children’s children and all the other children of the world who has no one else fighting for them. Your individual battle has a bigger purpose than just yourself. Your shield is used to protect you from incoming “flaming arrows of doubts” that the enemy will send your way. Back in those days the Roman soldier’s shield was wooden so those flaming arrows would hit that shield, get stuck then the flames from the arrows would engulf the shield. The soldier would then need to abandon the shield which would cause him to be open for more arrow that would hit him directly since he no longer had that shield to protect him. Likewise, the enemy will come to attack you with his “flaming arrows of doubts” and this is meant to take down your defensive weaponry. How does he do this? With thoughts like “God is not going to heal you of your sickness” He healed so and so but he’s not going to do it for you. He only succeeds if you believe what he says to you and you accept this as your fate. In these moments you should raise your Shield of Faith against that to say, “Yes, God is going to heal me because his word says (3 John 1:2) “Beloved, I pray that you may prosper in all things and be in health, just as your soul prospers.” “My soul is prospering because I am saved and I am God’s beloved therefore my health is also going to prosper” That word was not only written for “so and so” it was written for YOU! Your shield is going to quench or extinguish every one of these flaming arrows of doubt that the enemy would use against you. It is your faith. Your faith in God, His word, & His promises. Read your bible daily so that you know what God’s word says about your situation therefore you can raise your shield of faith against the attacks. The Helmet of Salvation protects your head, brain, thoughts, dreams, visions & what you see. You are saved! So it is your salvation that gives you use of this helmet. With the helmet of salvation on you have the mind of Christ, you have the ability to think as Jesus himself would have you think. Your thoughts are in line with God’s thoughts and you are able to clearly see your way. You’ll find that things that would normally bother you won’t bother you as much when you have on that helmet of salvation because now you’re seeing things God’s way. You’re going to be calm and what you say in the battle will be from God’s wisdom and not out of your own fleshly reaction. The Sword of the Spirit is also the word of God. Now I’m sure you’re thinking didn’t we put on the word of God already? This is different from the Belt of Truth. The Sword is the spoken word of God. The Belt of Truth is what you read and what you know the bible says while the sword of the Spirit is when you speak out aloud the word of God. As you study the bible you will have more scriptures that you can speak in battle. Jesus himself showed us how to use the Sword of the Spirit when He was being tempted by the devil. We see this in Matthew 4 or Luke 4. Here is an excerpt. We see that Jesus answered. This is something that was spoken aloud. When you use the Sword of the Spirit you are speaking God’s word out aloud and we need to do this as a part of our warfare against the enemy. So you see putting on the armor of God is going to protect you from the enemy. Please notice there is no coverage for your back because the bible doesn’t tell you to run from your enemy. It tells you to STAND. Stand so you can see the salvation of the Lord. You are not to be afraid or terrified because you are protected. Just go back and read how many times the word “stand” appears in the text. When you enter into a war with your armor on the demons as well as the angels can see that you are protected. They know that you are prepared so they are more likely to flee because they know you are not being caught off guard. You won’t be running but they will! So, How do you put on the Armor of God? Father God, thank You for your Armor which is given to me to fight against the enemy. I know that my war is not against flesh and blood so therefore I stand firm then, with the belt of truth buckled around my waist thank you for your word. Your word is truth and I pray that every decision that I make today would be based on your word. I put the breastplate of righteousness in place to protect my heart for out of the heart the mouth speaks.May the words of my mouth and the meditation of my heart be acceptable in your sight, Oh Lord my Rock and my Redeemer, and with my feet fitted with the readiness that comes from the gospel of peace. In addition to all this, I take up the shield of faith, with which I can extinguish all the flaming arrows of the evil one. I believe your word and I have faith in it.. Taking the helmet of salvation to protect my mind, my thoughts, my dreams, my vision and what I see. Thank you for saving me. And the sword of the Spirit, which is the word of God. Give me the scriptures that I need to speak against the enemy when he comes to attack me, in Jesus Name Amen. Brothers and Sisters, when you are done praying this prayer you have the armor of God on. Though you cannot see it, the enemy can! You are protected. And the enemy is less likely to attack someone who’s prepared and ready for battle. When you look at yourself in the natural realm you’ll just look normal like you do everyday but in the spiritual realm they will see you in your battle gear. It is so awesome to know that God has not abandoned us! Everything we need is in the Word so spend some time reading the bible everyday. We’d love to hear from you. Please share your thoughts and comments below. Thank you so much for this teaching on the armour of God. Though I’ve been a Christian for years ,this is the first time I fully understand the importance of the armour of God. Your teaching is easy to understand and it is really guiding me in prayer. 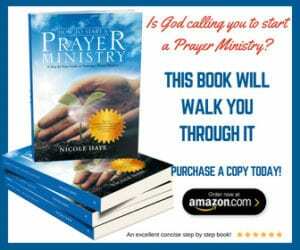 I love to pray but I have been struggling on how to pray and be a prayer warrior. I have ended up being frustrated with myself for failing to pray. I trust that I will learn more from this website and I believe God has a reason for me to bump into you. To God be the glory for you and your mission to teach us to pray not only for ourselves, but for the world. I was feeling really down until I read this article, I have 2 sons one is in prison and the other one is being deployed to Iraq tomorrow,and they probably don’t know about God’s Armor but I’am praying for God to cover them with his precious blood, I will pray for the Armor of Protection for them, In Jesus Name Amen. Thank you for your explanation of what it truly means to put on the armor of God. I’ve been saved for many years and have read many “prayers” concerning the armor, but none has ever explained it to the extent you have. You obviously spend time in prayer with our God and He gives you great revelation. Your prophecy for this month is are a real blessing to me because I’m definitely in transition right now and the article has provided me with godly information I can use to get to where God is leading me. I pray that you will continue to allow God to use you to bless the body of Christ. May His face always be upon you, In Jesus’ Name, Amen. God bless you for these articles, God’s Spirit continually Rest on you and increase you on every side, i pray that you continually grow in wisdom and in the knowledge (Epignosis) of him, The Spirit of God will cause you to prosper in all that you do and will continually equip you with Grace to make tremendous impact on the lives of many across the world in the name of the Lord Jesus…amen. Sir, please kindly pray with/for me, i am currently experiencing challenges in my career, i am an employed sales lady currently working for a technology company here in Abuja, Nigeria’s Federal capital territory, i joined the company on the 4th of October 2016, and was making good sales, word went around the company that i was one of the best marketers in the company, However Sir, this is no longer the case as it is exactly the opposite now, i have not made a single sale in nearly three months now, and my boss i believe is already considering relieving me of my appointment. i am currently praying and fasting, an exercise i started today the 5th of may 2017 and i intend to continue till sunday the 7th of may 2017.
please pray for me sir, i need God to open miracle doors for me and cause me to make great sales in this month of may, i want to make a minimum of one million Naira sales and i trust that God can make it happen sir. i look forward to sharing my testimonies on this blog before or by the end of this month…thank you sir, God bless you and please kindly get back to me if you can. I just read your article and i am really blessed.please help join me end this fight on monitoring spirit and eveil spiritual association.i see 2 eyes staring at me in my dream and black birds,and in reality ve been seen a particular birds (crow and hawk) following me in d day. sometimes there’s one with long legs like what you have in your page standing at a roof opposite my house staring at me.I have only come to realize that this most be monitoring spirit weeks back and with a better understanding of what i read on your page,God bless you.